This book has garnered a good amount of hype among critics, reviewers, and pundits. I didn’t want to read it because I assumed my heightened expectations would be let down by the finished product. It turns out, I was worried over nothing. 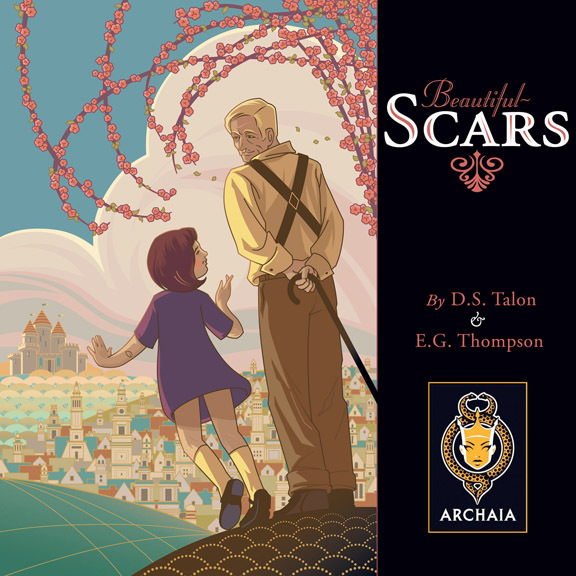 Beautiful Scars seamlessly weaves together two stories that centralizes on the relationship between a grandfather, Ridley, and his granddaughter, Maddie. Imagination is the skeleton key a person’s heart and soul and Ridley helps Maddie unlock her own voice through his memories of how his scars came to be. This makes it a personal read because everyone has received a scar at some point in their life and with that lies a story on how it got there. Plus, we all have fond memories of that one person or family member who inspired us. The true brilliance of the book lies with how D.S. Talon and E.G. Thompson made two stories feel like one. In many ways, Maddie’s book of fantastical adventure and Ridley’s tales of days gone by are one in the same. Hearing about Ridley’s influence and seeing it unfold as it bears creative fruit is truly marvelous accomplishment in storytelling. Maddie’s book is a part of this collection which was a real nice touch because it gives you the sense that her story is real because in many ways, it is. I absolutely loved how the creators used their artist talents to make the two stories look and feel different while not taking the reader out of the experience. I ended the last paragraph with the word “experience” because that’s what Archaia has given us. It’s not a book, it’s an experience that not only encourages, but reminds us of the most important things in life. ‹ I’ve Been Quoted for a Review!